Surveillance video shows two men storming the store, with one of the suspects armed with what appears to be a machine gun. 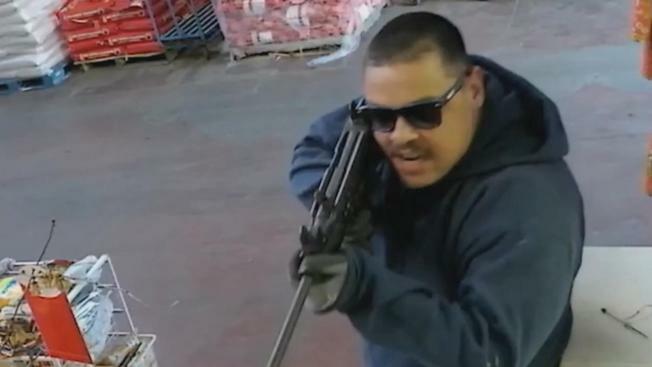 Police are asking for the public's help identifying suspects wanted in a brazen armed robbery in San Jose. The armed robbery occurred on April 23 at HP Foods, located at 830 S. 3rd Street, according to police. Surveillance video shows two men storming the store, with one of the suspects armed with what appears to be a machine gun. One of the men punched an employee in the face before taking cash. The suspects then drove away from the store in an early 2000 Silver Acura TL with no front license plate. Neighbors were stunned to see the footage and hear about the crime. "It's very violent," said Jesse Ortiz. "It's kind of crazy because this is just like a grocery business." The first suspect, who police said was armed with a machine gun, is described as a man between 30 to 49 years old, standing 5 feet 10 inches tall, 200 pounds, black hair with a mustache. He was last seen wearing a white undershirt, blue-hooded sweatshirt, brown construction boots and black pants. The second suspect is described as a man between 25 to 35 years old, standing 5 feet 10 inches tall, 200 pounds and having black hair. He was last seen wearing a black shirt with "DBD" on front, gray sweatpants, black ski mask and gray tennis shoes. Another resident, Ana Perez, who lives just down the street from the warehouse, carries pepper spray with her because of recent crime in the neighborhood. "That's the scary thing, too. Because they're carrying weapons around here, and there's a school around the corner," Perez said. Anyone with information is asked to contact Detective Mike White of the San Jose Police Department's Robbery Unit at 408-277-4166.